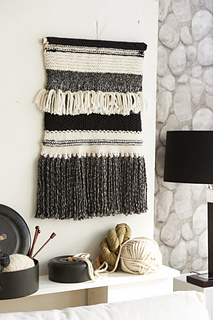 Get in on the latest interior design trend with a simple woven-look wall hanging. It’s knit in one piece, with stripes and knit/purl patterns creating a textured look. Contrasting fringe is fastened along the bottom eyelet row and center triple-yarnover panel.